Scilly Linen offers a full commercial linen and laundry solution for hotels, guest houses, holiday homes and restaurants throughout the Isles of Scilly. We aim to remove the environmental and logistical consequences of shipping laundry to the mainland, as well as minimising any environmental impact on the islands. We achieve this by using a state of the art Lagoon™ laundry system, the most technically advanced and environmentally friendly system available and the first water-based cleaning system to obtain the endorsement of Woolmark. 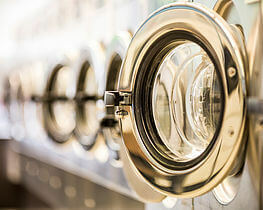 Our system is essentially the environmentally friendly alternative to traditional dry cleaning. All our machinery is energy-efficient, no solvents are used and all products are biodegradable for chemical free drainage. Our energy efficient industrial iron automatically adjusts the ironing speed to the moisture retention of the material so we can press sheets, duvet covers and tablecloths perfectly. You will be amazed at how much time you can save. Scilly Linen can safely wash your quilts and curtains and indeed all types of garment fibres, including the most delicate silks, cashmeres and pure new wools. We can also clean special synthetic fibres such as Lycra, GoreTex and leather. Using the least amount of water and electricity is important to us, but we are equally delighted with the results and we think you will be too. Simply contact us with your requirements and we will collect your old items and replace them with a clean, pressed and folded supply. For individual orders you can use our online order form. For contract laundry services, call us on 01720 422082 for a no-obligation quote or email enquiries@scillylinen.com. Orders received before 10:00am will be delivered to addresses on St Mary's the same day. For all returns, please ensure you insert a completed Returns Form in the laundry bag.